Sitagliptin, sold under the brand name Januvia among others, is an medication used to treat diabetes mellitus type 2. It is generally less preferred than metformin or a sulfonylurea. It is taken by mouth. It is also avaliable within a single pill as metformin/sitagliptin. Common side effects include headaches, swelling of the legs, and upper respiratory tract infections. Serious side effects may include angioedema, low blood sugar, kidney problems, pancreatitis, and joint pain. It is unclear if use in pregnancy or breastfeeding is safe. It is in the dipeptidyl peptidase-4 (DPP-4) inhibitor class and works by increasing the production of insulin and decreasing the production of glucagon by the pancreas. Sitagliptin was developed by Merck & Co. and approved for medical use in the United States in 2006. A month supply in the United Kingdom costs the NHS about 33.26 £ per month as of 2019. In the United States the wholesale cost of this amount is about 405.00 USD. In 2016 it was the 82nd most prescribed medication in the United States with more than 9 million prescriptions. Sitagliptin is used to treat diabetes mellitus type 2. It is generally less preferred than metformin or a sulfonylureas. It is taken by mouth. It is also avaliable within a single pill as metformin/sitagliptin. Adverse effects from sitagliptin are similar to placebo, except for rare nausea, common cold-like symptoms, and photosensitivity. It does not increase the risk of diarrhea. No significant difference exists in the occurrence of hypoglycemia between placebo and sitagliptin. In those taking sulphonylureas, the risk of low blood sugar is increased. The existence of rare case reports of renal failure and hypersensitivity reactions is noted in the United States prescribing information, but a causative role for sitagliptin has not been established. Several postmarketing reports of pancreatitis (some fatal) have been made in people treated with sitagliptin and other DPP-4 inhibitors, and the U.S. package insert carries a warning to this effect, although the causal link between sitagliptin and pancreatitis has not yet been fully substantiated. One study with lab rats published in 2009 concluded that some of the possible risks of pancreatitis or pancreatic cancer may be reduced when it is used with metformin. However, while DPP-4 inhibitors showed an increase in such risk factors, as of 2009, no increase in pancreatic cancer has been reported in individuals taking DPP-4 inhibitors. Hypersensitivity reactions including anaphylaxis, angioedema, rash, urticaria, cutaneous vasculitis, and exfoliative skin conditions including Stevens-Johnson syndrome; hepatic enzyme elevations; acute pancreatitis, including fatal and nonfatal hemorrhagic and necrotizing pancreatitis; worsening renal function, including acute renal failure (sometimes requiring dialysis); severe and disabling arthralgia; constipation; vomiting; headache; myalgia; pain in extremity; back pain; pruritus; pemphigoid. In 2015, FDA added a new Warning and Precaution about the risk of "severe and disabling" joint pain to the labels of all DPP-4 Inhibitor medicines. In addition to sitagliptin, other DPP-4 inhibitors such as saxagliptin, linagliptin, and alogliptin must also carry the new FDA Warning and Precaution label. Sitagliptin works to competitively inhibit the enzyme dipeptidyl peptidase 4 (DPP-4). This enzyme breaks down the incretins GLP-1 and GIP, gastrointestinal hormones released in response to a meal. By preventing breakdown of GLP-1 and GIP, they are able to increase the secretion of insulin and suppress the release of glucagon by the alpha cells of the pancreas. This drives blood glucose levels towards normal. As the blood glucose level approaches normal, the amounts of insulin released and glucagon suppressed diminishes, thus tending to prevent an "overshoot" and subsequent low blood sugar (hypoglycemia) which is seen with some other oral hypoglycemic agents. 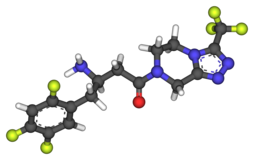 Sitagliptin has been shown to lower HbA1c level by about 0.7% points versus placebo. It is slightly less effective than metformin when used as a monotherapy. It does not cause weight gain and has less hypoglycemia compared to sulfonylureas. Sitagliptin is recommended as a second-line drug (in combination with other drugs) after the combination of diet/exercise and metformin fails. Sitagliptin was approved by the U.S. Food and Drug Administration (FDA) on October 17, 2006, snd is marketed in the US as Januvia by Merck & Co. On April 2, 2007, the FDA approved an oral combination of sitagliptin and metformin marketed in the US as Janumet. On October 7, 2011, the FDA approved an oral combination of sitagliptin and simvastatin marketed in the US as Juvisync. ^ a b Herman GA, Stevens C, van Dyck K, Bergman A, Yi B, De Smet M, Snyder K, Hilliard D, Tanen M, Tanaka W, Wang AQ, Zeng W, Musson D, Winchell G, Davies MJ, Ramael S, Gottesdiener KM, Wagner JA (December 2005). "Pharmacokinetics and pharmacodynamics of sitagliptin, an inhibitor of dipeptidyl peptidase IV, in healthy subjects: results from two randomized, double-blind, placebo-controlled studies with single oral doses". Clin Pharmacol Ther. 78 (6): 675–88. doi:10.1016/j.clpt.2005.09.002. PMID 16338283. ^ a b c d e f g h i j "Sitagliptin Phosphate Monograph for Professionals". Drugs.com. American Society of Health-System Pharmacists. Retrieved 3 March 2019. ^ a b c British national formulary : BNF 76 (76 ed.). Pharmaceutical Press. 2018. p. 681. ISBN 9780857113382. ^ "Sitagliptin Pregnancy and Breastfeeding Warnings". Drugs.com. Retrieved 3 March 2019. ^ a b "Januvia Side Effects & Drug Interactions". RxList.com. 2007. Archived from the original on 2007-11-20. Retrieved 2007-11-28. ^ Zhao Q, Hong D, Zheng D, Xiao Y, Wu B (2014). "Risk of diarrhea in patients with type 2 diabetes mellitus treated with sitagliptin: a meta-analysis of 30 randomized clinical trials". Drug Des Devel Ther. 8: 2283–94. doi:10.2147/DDDT.S70945. PMC 4234286. PMID 25419118. ^ Salvo, Francesco; Moore, Nicholas; Arnaud, Mickael; Robinson, Philip; Raschi, Emanuel; De Ponti, Fabrizio; Bégaud, Bernard; Pariente, Antoine (3 May 2016). "Addition of dipeptidyl peptidase-4 inhibitors to sulphonylureas and risk of hypoglycaemia: systematic review and meta-analysis". BMJ. 353: i2231. doi:10.1136/bmj.i2231. PMC 4854021. PMID 27142267. ^ Olansky L (2010). "Do incretin-based therapies cause acute pancreatitis?". J Diabetes Sci Technol. 4 (1): 228–9. doi:10.1177/193229681000400129. PMC 2825646. PMID 20167189. ^ "Januvia for type 2 diabetes". Merck & Co. Archived from the original on 2012-09-07. Retrieved 2010-07-31. ^ National Prescribing Service (August 2010). "Sitagliptin for Type 2 Diabetes". Archived from the original on 18 July 2010. Retrieved 27 August 2010. ^ "DPP-4 Inhibitors for Type 2 Diabetes: Drug Safety Communication—May Cause Severe Joint Pain". FDA. 2015-08-28. Retrieved 1 September 2015. ^ Herman G, Bergman A, Liu F, Stevens C, Wang A, Zeng W, Chen L, Snyder K, Hilliard D, Tanen M, Tanaka W, Meehan A, Lasseter K, Dilzer S, Blum R, Wagner J (2006). "Pharmacokinetics and pharmacodynamic effects of the oral DPP-4 inhibitor sitagliptin in middle-aged obese subjects". J Clin Pharmacol. 46 (8): 876–86. doi:10.1177/0091270006289850. PMID 16855072. ^ Gadsby, Roger (2009). "Efficacy and Safety of Sitagliptin in the Treatment of Type 2 Diabetes" (pdf). Clinical Medicine: Therapeutics (1): 53–62. ^ "FDA Approves New Treatment for Diabetes" (Press release). U.S. Food and Drug Administration (FDA). October 17, 2006. Retrieved 2006-10-17. ^ "FDA Approves Combination Therapy Juvisync" (Press release). U.S. Food and Drug Administration (FDA). October 7, 2011. Retrieved 2013-11-17. This page was last edited on 23 March 2019, at 11:15 (UTC).